I’d like to start a regular book nook section on this blog of mine. I’m an avid reader, when I’ve got the time, and each year I resolve to make a bit more time of it. In the last year, I’ve joined websites like NetGalley, which has given me more of an impetus to read more. I’ve also started buying EVERYTHING Kindle Deals have to offer – meaning my To Read List is often much larger than my abilities to read it all! So during 2018, I’m going to have a dedicated Book Nook post – the things I’ve been reading, what is next on my list, and other thoughts on reader-y things. There may be other book review posts in between, but there will definitely be at least one a month. So, as always, it’s best to start at the beginning – what have I been reading this month? I’d heard a lot about this book, it’s been on bestseller lists since it came out but I’ve put it off for a while. I started it while at a much-needed hair appointment and again, couldn’t put it down. The anti-social reader in me came out. When a newborn baby dies after a routine hospital procedure, there is no doubt about who will be held responsible: the nurse who had been banned from looking after him by his father. What the nurse, her lawyer and the father of the child cannot know is how this death will irrevocably change all of their lives, in ways both expected and not. Small Great Things is about prejudice and power; it is about that which divides and unites us. It is about opening your eyes. Given the political environment of the world in the last couple of years, it’s a timely book and it really does open our eyes to the world views and how they are formed. There are – as expected – a number of twists and turns towards the end of the book, and it didn’t disappoint with those. Picoult is expert at weaving stories where even when you walk in knowing who the good and the bad guys are, you wind up questioning it many, many times throughout. Pick it up here. Technically, this was a read from last year, but it’s gotten released this month so I was flicking through it again at the start of the month. Sophie’s husband James is a loving father, a handsome man, a charismatic and successful public figure. And yet he stands accused of a terrible crime. Sophie is convinced he is innocent and desperate to protect her precious family from the lies that threaten to rip them apart. Kate is the lawyer hired to prosecute the case: an experienced professional who knows that the law is all about winning the argument. And yet Kate seeks the truth at all times. She is certain James is guilty and is determined he will pay for his crimes. Who is right about James? Sophie or Kate? And is either of them informed by anything more than instinct and personal experience? This political relationship thriller ticks a lot of boxes. Insight into the goings on of the Boys Club in Parliament? Family drama? A legal case with all the twists and changes, and some flashbacks to fill in the blanks? Tick tick tick. The story isn’t easy to guess the twists and turns in, and I really enjoyed figuring it out as it went along. For our current climate where issues of sexual conduct in the workplace and in the public eye are taking hold, it’s a novel that I feel will definitely resonate with a lot of readers. Get it here. Melissa Hill’s latest novel is a hardhitting topic which parents everywhere will relate to – questions about the way you parent, and how the actions you do can affect not just your child but everyone around them. The pro or anti vaccination arguments go around parenting circles every so often and are ones that turn vicious, so when I saw that this was the subject matter of her newest book, I was intrigued to see how it would be treated. For single mum Kate O’Hara, there was no decision to make. Her daughter Rosie is one of a small percentage of Irish children with a disorder that prevents her from being vaccinated against measles. All Kate can do is hope that herd immunity keeps the disease at bay, and her little girl safe. For Madeleine Harrington, it was a leap of faith she wasn’t prepared to take. Which is why she and her husband decline controversial measles jabs for their daughter Clara. All she can do is pray that it’s the right decision and if her little girl becomes sick, she gets through it unscathed. The two girls have just started primary school in the same class. And when one day, tell-tale red spots appear on Clara Harrington’s chest, and Rosie’s a few days after, both mums fear the worst…how can this be happening when all they wanted was to keep their children safe? The story takes some predictable (and some not so predictable) twists and turns, and your heart is left in your mouth at some stages wishing that situations get better. I also found the arguments about Madeleine’s blogging and sharing her family stories interesting as a parenting blogger, it’s definitely something which crosses our minds: what to share, and what will others think about how we parent? Really great read that I zoomed through. Pick it up here. I only discovered Lisa Jewell last year, but I really liked The Girls, so when I saw another one pop up in my suggestions I was intrigued. Laurel’s 15-year-old daughter is the good girl, the pretty girl, the apple of her mother’s eye. She left the house to go to the library and was never seen again. As a parent, it’s your worst nightmare. Seeing how life goes on for the family, and for Laurel in particular, over the ten years, it shows just how the loss has shattered not just Ellie’s life but those around her. While the twists and turns became somewhat predictable from the middle of the book, it still made a great read that I read in one night. Get your copy here. 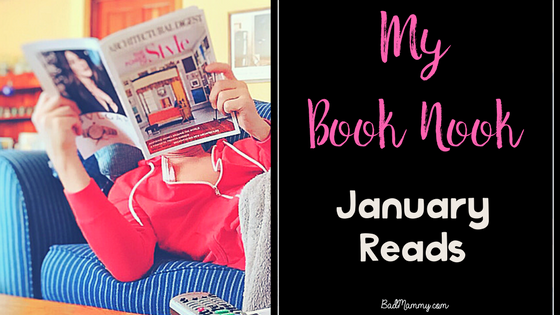 So, those are my reads of this January Book Nook – what have you been reading? Got any recommendations for me? Let me know in the comments below, or say hello on Facebook or Twitter. I’d love to hear from you! BadMammy is on Instagram – come say hi! « Pain Acceptance: Embracing Reality or Brushing It Off?